School Shooter Armed With 'Hundreds' Of Rounds Of Ammunition, Police Say : The Two-Way Police say the gunman had multiple magazines with a capacity of 30 rounds for each of the three weapons he used in the Newtown, Conn., assault. 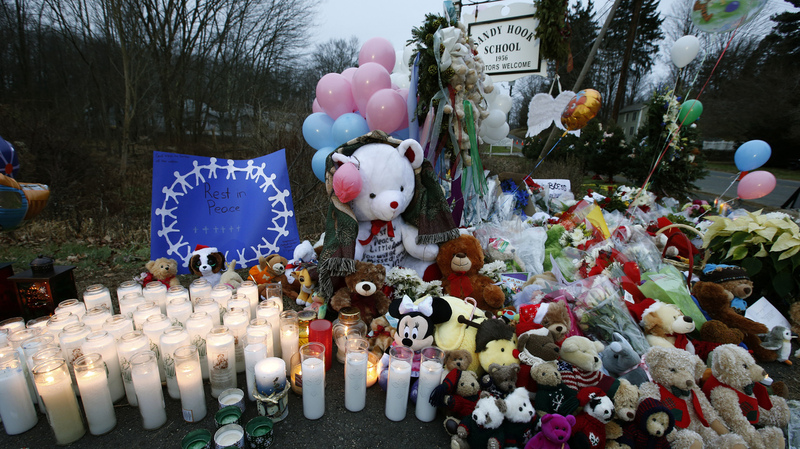 A makeshift memorial was set up near the entrance to the Sandy Hook Elementary School on Sunday. Police on Sunday said 20-year-old Adam Lanza was armed with a high-powered rifle, two handguns and hundreds of rounds of ammunition when he forcibly entered a Newtown, Conn., elementary school and proceeded to gun down 20 young students and six faculty members. The latest information on the tragedy, the worst violence at an elementary school in U.S. history, came ahead of President Obama's arrival in the town where Friday's mass shooting took place. The president met with families of the victims and planned to attend an evening vigil, where he will speak. Connecticut State Police Lt. J. Paul Vance, speaking at an afternoon news conference, said "the weapon that was utilized most of the time during the crime was a [.223 caliber] Bushmaster rifle." Lanza also carried a 9mm Sig Sauer and a 10mm Glock, both handguns, he said, adding that one of the handguns had been used by the assailant to take his own life. Vance said the death of the shooter's mother, Nancy Lanza, had officially been ruled a homicide. She was shot and killed by her son at her suburban home before his rampage at the Sandy Hook Elementary School. Earlier Sunday, Connecticut Medical Examiner Wayne Carver said that Ms. Lanza had been shot multiple times in the head. Vance said "all weapons had multiple magazines and ammunition," adding that each of the magazines had a capacity of approximately 30 rounds. Asked by reporters how many rounds there were in total, he replied: "hundreds." Vance said a fourth weapon, a shotgun, had been recovered in the vehicle Lanza drove to the school on the day of the attack. Earlier, officials had suggested that weapon was recovered from the home the assailant shared with his mother. The police lieutenant reiterated remarks he had made an earlier media briefing, saying that authorities were "pleased with the work that has been done so far," but that determining a motive for the crime would take "many, many man hours." Without elaborating, he also repeated an earlier warning to anyone who "harasses, threatens or intimidates the investigation ... either in person, also on the Internet, via social media or telephone." Any person doing so would be fully prosecuted, he said. At an earlier news conference on Sunday, Vance said forensic analysis and interviews of witnesses would take considerable time. "I am confident that we will put every single resource into this investigation ... and our goal is to answer every single question," he told reporters. Vance said authorities had spoken to "many, many witnesses, but there are many more." He added that the interviews might extend to children who survived the attack, noting there was an "immense number of witnesses." "There is weeks worth of work that needs to be done to complete this [investigation]," he said. Vance also warned members of the media and public that "misinformation" was being disseminated via social media sites. Information on such unofficial sources, he said, "cannot be confirmed and in many cases [is] inaccurate." Vance elaborated that "threatening and inaccurate" information was coming from "people posing as other people" on social media. Vance confirmed that the school had been "forcibly entered." He also said four weapons had been linked to the killings in Newtown. Earlier, authorities said three firearms were found at the school: a Sig Sauer handgun, a Glock handgun and a .223-caliber Bushmaster rifle. A law enforcement source tells NPR's Carrie Johnson that the fourth weapon was found at the Newtown home where Adam Lanza lived with his mother, and that it was used to kill her. The source tells NPR that all four weapons had been purchased legally by Nancy Lanza. Separately, Ginger Colbrun, a spokeswoman for the Bureau of Alcohol Tobacco and Firearms, tells NPR that ATF agents have fanned out across the greater Newtown area to visit gun stores and shooting ranges to possibly learn more about the gunman's activities in the weeks, months and even years before the attack. Adam Lanza entered Sandy Hook Elementary School on Friday morning and gunned down 20 children and six adults, including the school's principal, before killing himself. Connecticut Gov. Dan Malloy tells ABC's This Week that authorities believe Lanza shot himself as first responders closed in. "We surmise that ... he heard responders coming and apparently at that, decided to take his own life," Malloy said. In a subsequent appearance on CNN, Malloy described the gunman as "troubled" but would not elaborate on his mental state. He reiterated that the shooter had "used a gun on himself." An emotional Malloy said he is the one who had to tell the families that "their loved ones would not be returning to them." In Newtown, NPR's Susannah George says, "there is a constant stream of people coming and going from the makeshift memorial at the entrance to Sandy Hook Elementary School. Many people have come from out of town — some as far as an hour away — to lay flowers and light candles." Also on Sunday, Newtown's St. Rose of Lima Church was evacuated for about an hour during services after a phoned-in bomb threat, says Brian Wallace, director of communications for the Diocese of Bridgeport. Police and a SWAT team arrived on the scene with guns drawn, but authorities later said there was no danger. The Associated Press reported that the church would remain on lockdown for the rest of the day as a precaution. Asked about the incident at the afternoon news conference, Vance confirmed that the church and the rectory had been thoroughly searched and that an investigation into the incident was underway. Twelve girls and eight boys were killed. Sixteen of them were just 6 years old and four were only 7. School officials say Principal Dawn Hochsprung, 47, and school psychologist Mary Sherlach, 56, were shot and killed as they tried to stop Lanza. Teacher Anne Marie Murphy, 52, was killed as she shielded her students, authorities say. Teachers Victoria Soto, 27, Rachel Davino, 29, and substitute teacher Lauren Garbrielle Rousseau, 30, were also among the dead. Nancy Lanza, the first of the six adult victims, was a former stockbroker, who divorced the shooter's father in 2008. There was a common refrain among acquaintances of Adam Lanza: I knew of him but I didn't know him. Lanza kept to himself. Over several bloody minutes Friday morning, armed with a rifle, Lanza emerged from his shell long enough to destroy the lives of 20 first-graders and six adults at Sandy Hook Elementary School. He'd gone to the school as a youth, a former classmate said. Lanza, who lived with his mother in a colonial home in an upscale neighborhood of Newtown, was estranged from his brother, Ryan, and hadn't spoken in four years with his father, Peter Lanza, who is an executive at General Electric. The elder Lanza released a statement on Saturday expressing shock and sadness over the killings. Ryan Lanza, who was originally misidentified as the shooter, lives in Hoboken, N.J. The assailant's aunt, Marsha Lanza, spoke with reporters from the doorstep of her home in suburban Chicago on Saturday. She described her nephew as "a very bright boy," who was "different" and quiet.
" ... nice kid good kid, I mean he was definitely challenging family in that house. Every family has one, I have one, they have one, but never in trouble with the law, never in trouble with anything," she said. NPR's Brian Naylor reports that law enforcement officials would not confirm that Lanza had Asperger's Syndrome, a form of autism that is characterized by social awkwardness and other difficulties in relating to others. The aunt said Lanza's mother "had issues with school she eventually wound up home-schooling him and she battled with the school district. In what capacity, I'm not certain if it was behavior [or] if it was learning disabilities." Naylor reports that authorities believe the guns used in the assault were all legally obtained by Nancy Lanza. "A number of reports have quoted family friends saying she and her son had gone to area shooting ranges together," he says. The New York Times quotes Dan Holmes, an acquaintance of Ms. Lanza, as saying she had several different guns, "I don't know how many," he told the newspaper, adding that "She would go target shooting with her kids." Newtown Schools Superintendent Janet Robinson has said that Sandy Hook students and staff would relocate to Chalk Hill School in nearby Monroe. While police investigators have so far offered no motive for the deadly assault, Gov. Malloy suggested Saturday that a truly complete picture might never be known. "When tragedies like this take place, people often look for answers, an explanation how this could have happened. The sad truth is there are no answers. No good ones, anyway," Malloy said. Later Sunday, President Obama was expected to meet privately with victims' families at Newtown. According to The Associated Press, the president also planned to meet with emergency personnel who responded to the shooting. Obama was scheduled to speak during a vigil Sunday evening at Newtown High School. The visit will be Obama's fourth as president to a community that experienced a mass shooting. Separately, The New York Times reports that following the shooting of Rep. Gabrielle Giffords in Tuscon, Ariz., the Department of Justice drew up guidelines for an expanded firearms background-check system aimed at keeping guns out of the hands of mental ill people and criminals, but that the plans were later shelved "as the election campaign heated up and as Congress conducted a politically charged investigation into the Operation Fast and Furious gun trafficking case." Sen. Dianne Feinstein (D-Calif.), speaking on NBC's Meet the Press, says she will revive a plan to ban new assault weapons. Meanwhile, Connecticut independent Sen. Joe Lieberman tells Fox News Sunday that a national commission could be formed to look into gun laws, the mental health system and the possible role that violent video games and movies might play in mass shootings.